This is a typical view of the larger train stations in Japan. I shot this in Kyoto, just underneath the Shinkansen platform. Up the escalators are the trains headed East for Tokyo and Nagoya. Through the turnstiles, on the left, takes you to the local trains headed throughout Kyoto and beyond. Dead center is the gift shop, which is very important in the Japanese culture. There’s a tradition in Japan, to bring gifts during your travels. Called Omiyage, you bring gifts to people you are visiting and buy gifts for people back home. 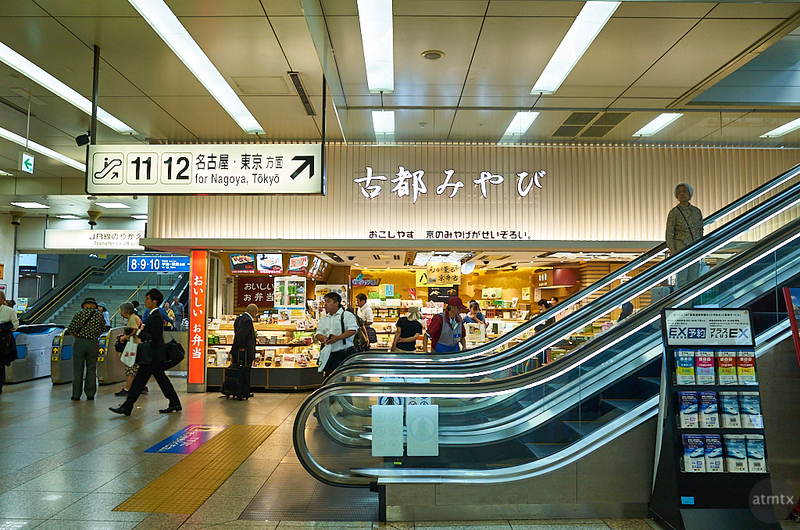 These stores are a convenient place to pick up something just before you board the train. Often they feature regional food delicacies that are not available in other cities. Thus, you can pick up a modest gift that is unique to the place you visited. These underground areas feature several competing gift stores as well as food to go. There’s everything from elaborate bento boxes to simple sandwiches that make the perfect meal, which always seem to taste better, when eaten on a long distance train.